Internationally renowned as the expert in making handcrafted deep pocket spring beds, Hypnos' range of pocket spring mattresses are now available to buy in-store and online. 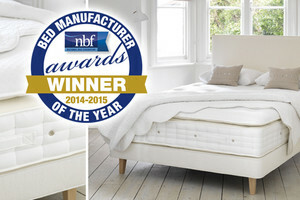 Awarded the prestgious NBF Excellence Award, and in receipt of a Royal Warrant, Hypnos' pocket spring mattresses can be found in the finest homes, yachts, palaces and hotels. Benefiting from Free Delivery and Free Recycling throughout Northern Ireland and Counties Dublin, Louth & Monaghan, at Dalzell's we’ll also provide Free Pillows and Remove & Dispose of Packaging and place your new mattress in a room of your choice. Delivery is also available at competitive rates throughout the rest of Ireland. With additional discounts for Multibuy, and our Price Promise, you can be sure you're getting a great deal because we appreciate your business! Call, Email or Visit Us In-store.